Tiwi beachfront exclusive villa vacation rental is situated in 25 acres of lush tropical paradise of the finest lend on the south coast of Kenya. The Tiwi Beachfront villa comprises 4 very large en-suite bedroom/sitting rooms, two bedrooms even have their own private Jacuzzi . Each bedroom has it's own mini kitchen with fridge and tea/coffee facilities. All four are situated around a beautiful designer swimming pool with split level waterfalls. The furniture is from the famous Funzi Furniture and the house and the interiors have been designed personally by Sabine Funk of Funzi Designs. The property has an informal restaurant/bar with full size snooker table. The restaurant straddles two 350,000 litre fresh water lakes right on the sea. Both lakes are full of Tilapia. A conference centre for 70 people is within the compound. At the front of the property perched atop the cliff is a small private banda for informal gatherings and sundowners. Even the Banda has it's own private plunge pool. There are secluded beaches to the immediate right and left of the cliff top. Private stabling for six horses are incorporated into the overall design and the first of six par three golf holes are ready for suitably qualified golfers. Provision is also made for helicopter landings. The property is heavily forested and much birdlife and wildlife are in residence. Tiwi beachfront villa is horseshoe shaped around a fabulous designer pool. Each side of the horseshoe has two floors where the bedrooms are found. In the centre of the horseshoe is the central dining area with a massive handmade table from Funzi Furniture which can seat 12 people. The southern wing has the two largest bedrooms. The one on the ground floor has it's own Jacuzzi. The upstairs bedroom on the southern side is over 90 square meters, also en-suite but with no Jacuzzi. The northern wing ground floor bedroom duplicates it's opposite side and the upstairs bedroom is just a slightly bit smaller but still very large by normal standards.All bedrooms are around the pool. This exclusive Villa is on self-catering service and has fully equipped kitchen and a cook and other household staff are included in the price. If you wish we can arrange to have all your shopping needs bought in before you arrive. The surrounding are of Tiwi beach offers endless possibilities of adventure.In the immediate vicinity there are many scenic walks, and a few hundred meters along the reef at low tide are the magnificent Tiwi rock pools. It is also a beautiful walk along the reef and beach to the Tiwi river. Here you will find magnificent sunsets silhouetting the ancient Baobab trees near the old Congo mosque, a building dating back centuries. The river is home to many birds including the rare nightjar heron. 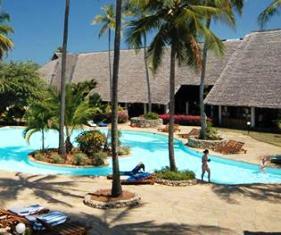 Diani, a popular European tourist destination is 12 kms away to the south. There you will find banks, restaurants, supermarkets, boutiques, bars, discos, casinos, car rental, hospitals, dentists and an 18-hole championship golf course. Deep sea fishing and any kind of safari can also be arranged from there. A nearby hotel in Tiwi offers windsurfing, diving, squash and tennis and a very modern gym. The nearest game park to Villa is the Shimba Hills Reserve, just 20 min. drive away. The park is famed for it's elephants, cape buffalo and the rare sable antelope. Further a field but still only a few hours by car is the largest game reserve in the world, Tsavo National Park. Here you will find all the big game Africa has to offer, including rhinoceros. We are happy to cater for all your wedding needs. We can arrange a priest and all the necessary documents to make your wedding as easy as writing us a mail. We will arrange the catering and accommodation and help with any transport needs. Luxury beachfront villa can accommodate the main bridal family of up to 10 persons while our neighbors can accommodate a further 100 guests. Absolute luxury, comfort, privacy and absolute security in one of Kenya's finest beachfront villa at an incredible value!